Buying burgers and boarding passes via a bot are one thing. Paying your utilities or credit card bill is another. 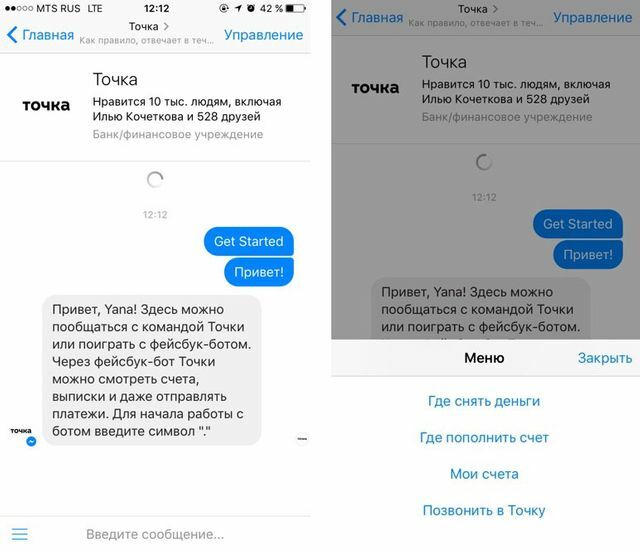 Tochka Bank in Russia recently launched a bot and over 12,000 clients used it on the first day, and an astonishing 50% of them initiated a payment. Imagine paying your bills, checking your account balance, getting help with financial questions, and generally managing all your everyday banking needs via Facebook. Sounds hard to believe? Not for customers of Tochka Bank in Russia, where all of this is possible today. Bots, of course, are big right now. Facebook has opened up its billion-user Messenger platform for business, and business wants to talk to customers. Apparently customers want to talk back: managing boarding passes for flights, sending flowers to someone special, and ordering hamburgers from Burger King.